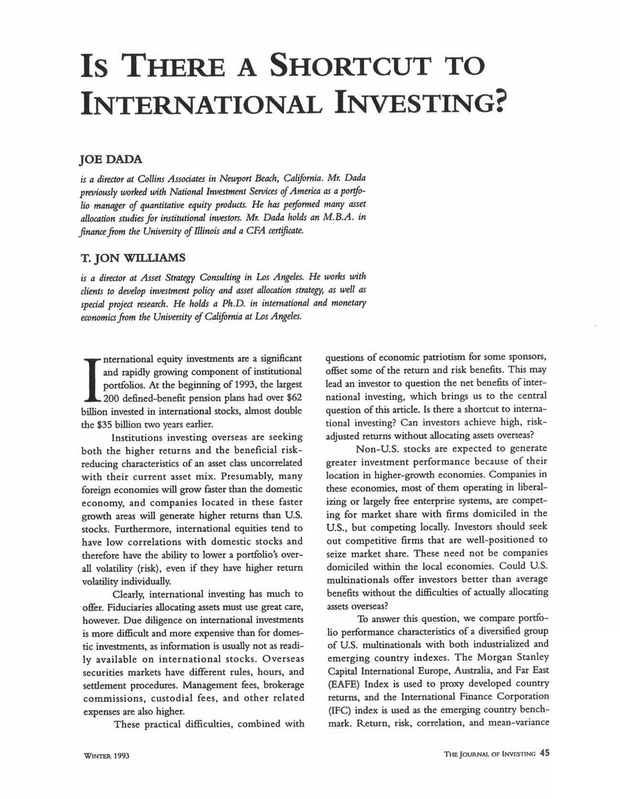 Is There a Shortcut to International Investing? A director at Collins Assodates in Newport Beach, California. Mr. Dada previously worked with National Investment Services of America as a portfolio manager of quantitative equity products. He has performed many asset allocation studies for institutional investors. Mr. Dada holds an M.B.A. in finance from the University of Illinois and a CFA certificate. A director at Asset Strategy Consulting in Los Angeles. He works with clients to develop investment policy and asset allocation strategy, as well as spedal projed research. He holds a Ph.D. in international and monetary economics from the University of California at Los Angeles. You are going to email the following Is There a Shortcut to International Investing?